who have been missing both my sense of humour and many words of wisdom), and working away on both Milton Street and Muir Street. I have now converted the DCC system I was using from the Gaugemaster Prodigy to the NCE Power Cab system which arrived in mid November, which means Bill, Joe and I are all using the same system. A bracket has been made to mount the PCP panel under the baseboard and the system has been tried successfully on Milton Street MPD. the walls above the top windows and will have to add another 3 course of stones to allow for the gutters. The windows (and there are well over 100) are being made using Scene Setters glazing bars. Each window has 2 pieces which have been weathered down and are overlapped - some being in the open position. Very time consuming but well worthwhile. the model railway room. The main lines on the scenic area will be on a gentle curve and a couple of signals will be included. There will be two loops in either direction capable of holding 2 short trains and up to 6 locos. intensive and therefore easier to operate. I'm hoping that this will be the final design but who knows? Since my last report some more progress has been made. 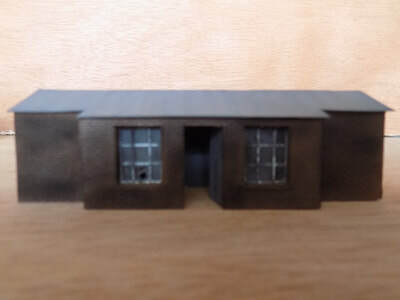 The steamie/bin sheds have all been completed, some more stock has been bought (which will have to be detailed and suitably weathered) with a view to forming some of the short trains that will eventually run on the layout and these will include 3 local 2 coach passengers, parcels, milk, coal and goods - not all will be used at the same time due to space limitations. ***Edit by Joe - AND HE'S BOUGHT A DIESEL!!!! a good few months.) A full size mock up has been drawn up to determine the position of the track, steamies and also the final length of the tenement. improves and the time is right. No decisions have been made as to the type of cassettes that will be used and this will be a topic for discussion at future group meetings - which hopefully I shall return to before much longer. There are no deadlines to work to thus avoiding any un-necessary pressure. I have decided that from the start of October I will need to concentrate on Milton Street MPD in preparation for the Preston show on March 2nd/3rd 2019. The storage boards will simply be to accommodate cassettes for light locos and some short trains. take many hours if being cut by hand. Joe supplied me with 3 sheets of embossed stone sheets and with some experimentation I have also been able to cut these out on the sample table. Within the last week I have ordered the timber, track (Peco code 75 finescale) and some other bits and bobs. exertions can tire me out. contact is being maintained with the rest of the group. Some fettling needs done to Milton Street MPD before the Preston show next year but when I get a chance I will be continuing with Muir Street. After many ideas having been bandied about regarding the storage areas of the layout including a turntable capable of holding 12 locos, my work colleague came up with the suggestion of basically reversing this idea, and having the equivalent of a roundhouse style set up, which with some experimentation is proving to be the final solution. This means that all boards will now be rectangular and all will be flush at the front of the layout - the storage boards being 3ft x 2ft. 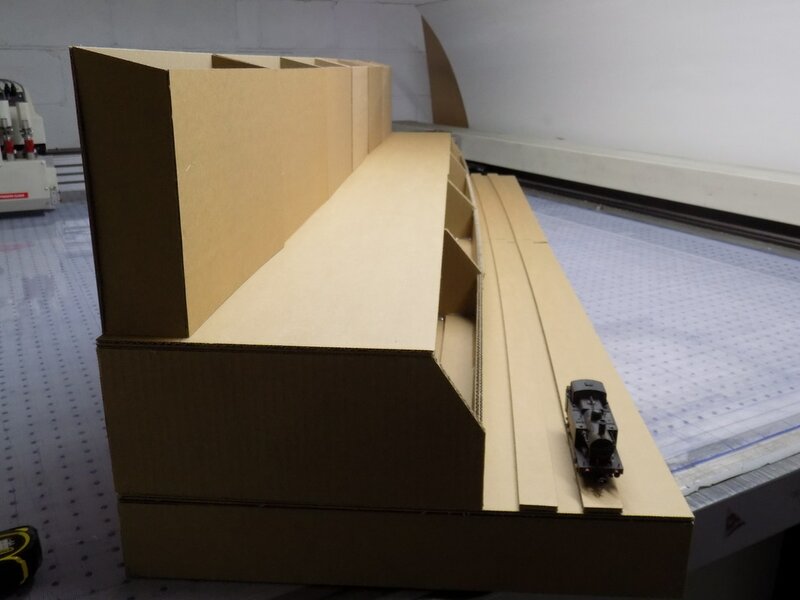 The scenic boards will follow the curve of the track on the front face.. 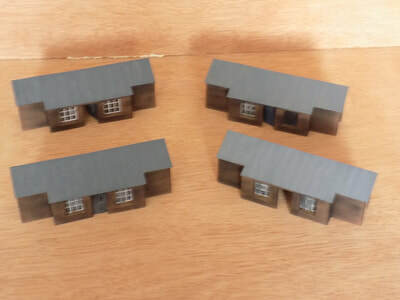 Storage lines are also included under the tenements as shown in the track plan and in total around 20 locos can be stored - this should be more than enough for operation at an exhibition. A Dapol turntable has been bought and built to see how it would suit the layout. It looks fine so another one is on order. The turntables will be manually operated with wipers soldered to the under side of the tracks for continuity and some sort of locating mechanism will be devised in due course. cassette system on the storage boards has been abandoned in favour of sector plates approximately 2ft long mounted on drawer runners. This system was used very successfully on Helenston and is also being incorporated into Eaglesham. There will be turntables at the ends of the sector plates. I have as yet not decided which model will be used and whether they will be manually or electrically operated. I am considering using SMP finescale track with handbuilt points (well, Bill built!). bridge at Motherwell on which these will be based is being planned. Although the bridge has been modernised photographs and measurements will be taken for reference. I have a number of photographs of the bridge in the 1960's and these will also be used to help in the construction of the models. 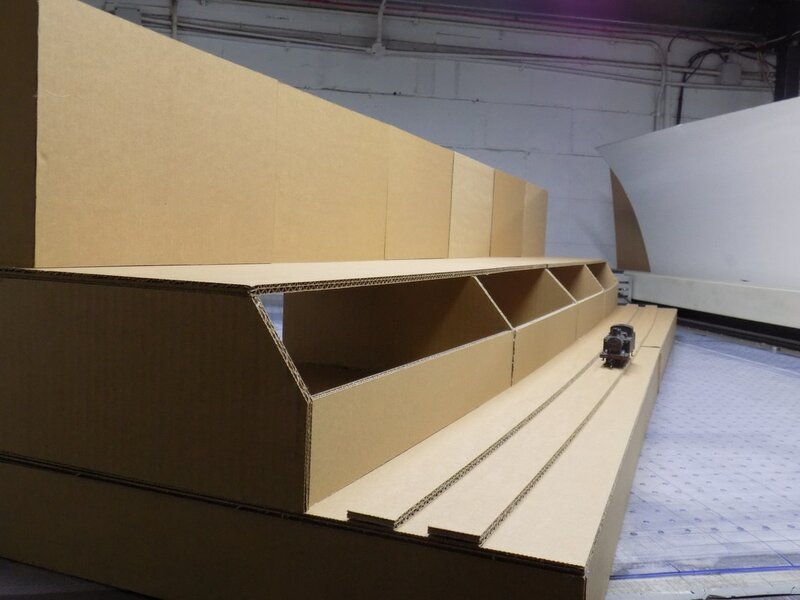 Working in a packaging company allows me access to the tools required to build a full size cardboard mock up which is shown in the photos above. 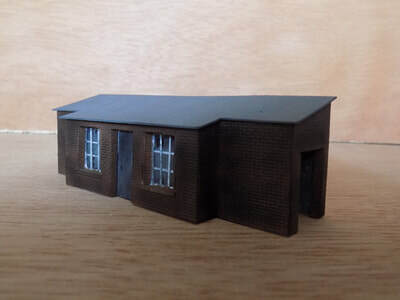 The original idea was to model the front of the tenament with a road but due to the dictating width of 18 inches it was decided to model the rear of the buildings. 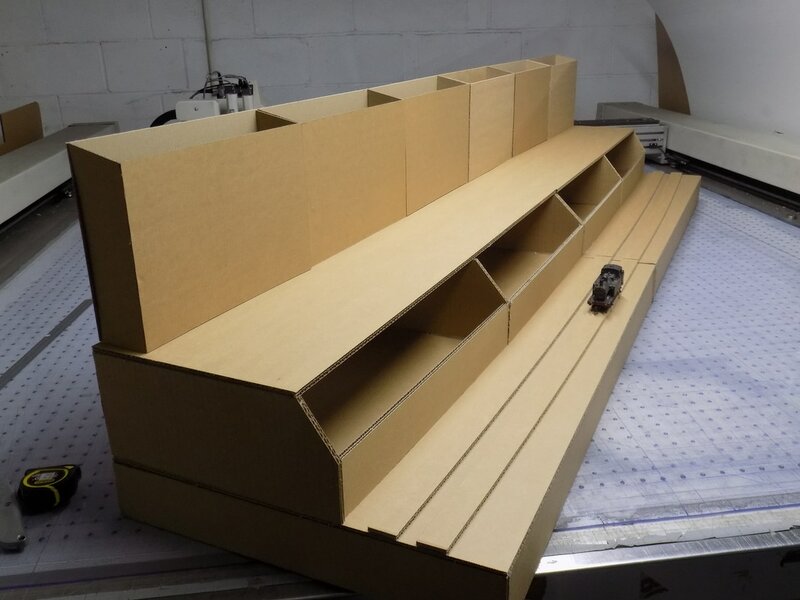 There will be baseboards at each end of the layout to hold locos in some sort of cassette system. Our small band of merry men have a lot going on at the moment and whilst I am champing at the bit to get started on Muir Street this will not happen for some time but happen it will and unlike Joe who changes his mind more times than there are days in the week during a group meeting, the layout will basically remain as seen. back and as usual this will be met with the unprintable response from yours truly. ​Progress reports will appear as and when they happen.